← At Last! A local historical society for Midleton and Ballinacurra. 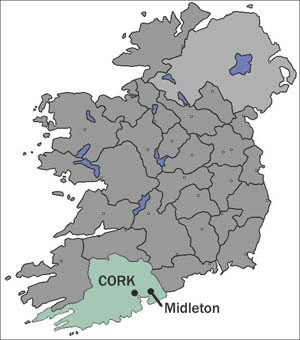 Our last post announced a meeting to form a historical society for Midleton and Ballinacurra. The good news is that over thirty people attended the meeting in Midleton Library on Monday 18th September and approved the creation of a society. There was much discussion but it was important to lay down a number of principles – leave politics and religion outside the door, and we were advised to spread our wings south to Roches Point, east towards Killeagh, north to Dungourney and Clonmult, west to Leamlara and Ballyannan. On the advice of Mr Willie Cunningham, who directed the process, a committee of seven (the ‘Magnificent Seven‘!) was selected with the power to appoint officers from amongst their number, with your author as Chairman. The committee is also empowered to co-opt an eighth member should that be warranted. We are now tasked with organising various matters – membership, a constitution, finance, lectures, talks and events. We are also tasked with establishing relationships with our neighbouring societies/groups at Cloyne, Aghada, Killeagh and Carrigtwohill. Oh, and we have to finalise a name for the society – the one given in the title is a working name for the moment. Best of luck. Fantastic idea. I will be looking forward to your progress from a Midleton man living in the bush in Australia! Thanks, Mark! You are not the only Midleton man to end up in Oz! Thanks, John, and welcome aboard! Thank you both very much for your support! My father came from castle Redmond Bullinacurra, his name was Henry Forde. is it possible for you to send me your news letters, or update of meetings. Lindsay, we may do a webpage or blog for the society. It will be announced on this site. Thank you, Lindsay. Now the hard work begins! HI Lindsey, my name is Graham Forde. I live in Cork. I read an article about you donating a model of the Terra Nova. My fathers side of the family are also descendants of Robert Forde. Roberts brother John is my Father’s Grandfather. Is it possible to exchange information. Hopefully we might find out more about the time the Hovendens were the town’s landlords (1552-1573)! Well done all. Not before its time. I foresee exciting and enlightening times ahead, creating a whole new perspective on our past. Thanks, Maria. Like you I hope we will soon find outlets for new information on Midleton’s past. Hello there. I found your site while yet again searching for my Grandfather and Great Grandfather. Alas still no luck. So I am delighted to know that there is a body of people like yourselves who are willing to commit to this project. I never met my maternal or paternal grandparents, however I have been able to research my maternal side and really enjoyed doing so. Grandfather Sheehan on the paternal side still remains an enigma. It doesn’t seem possible does it, to lose a whole family in Midleton ? Again, thank you for taking up this project on behalf of people like myself who are trying to fit together the pieces of a broken past.